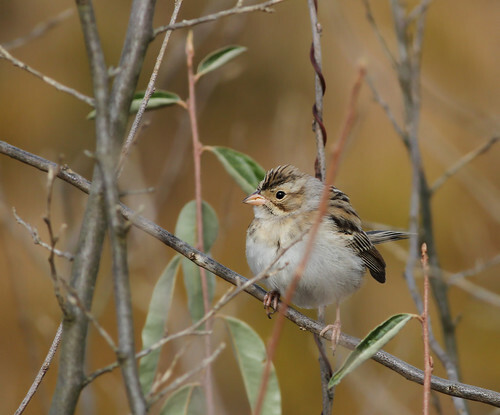 Clay-colored Sparrow at Glenhurst Meadows (photo by Jeff Ellerbusch). Jeff Ellerbusch found and photographed the only reported Clay-colored Sparrow in Morris and Somerset Counties for 2013 at Glenhurst Meadows today. It was near the gazebo mound just beyond the parking lot. It was not relocated later in the afternoon. Eastern Towhee, Am. Tree Sparrow, 2 Chipping, 13 Field, 10 Savannah, 12 Fox, 40 Song, 30 Swamp 60 White-throated Sparrows and 15 Dark-eyed Juncos round out the Emberizid totals. An amazing sight and sound of 90+ migrating Eastern Bluebirds (EABL) passed overhead at one point with many birds landing in the tops of trees. 30 more EABL at Wagner Farm make the total 120 for the day at Glenhurst. 6 Red-headed Woodpeckers, 1 Palm Warbler, 1 Purple Finch and the usual avian species were present. 118 Gadwall tallied at the Chatham Sewage Ponds establishes an all-time eBird high count for Morris County for one place at one time. Most were in the “natural” pond. Also in the ponds were 3 Wood Ducks, 30 Mallard, 2 Northern Shoveler drakes, 2 Ring-necked Ducks and 2 Hooded Mergansers. 6 Northern Pintail were on the ADP Pond on Hanover Rd., Florham Park. 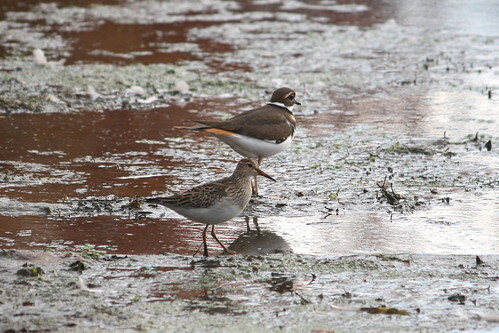 The Pectoral Sandpiper continues for a 9th day at Loantaka Brook Reservation (Julie Buechner). 4 Red-headed Woodpeckers, 3 Am. Tree Sparrows, 4 Fox Sparrows, etc. were eBirded from Troy Meadows today (Julie Buechner). The email post mistakenly says “15 Dark-eyed Juncos round at the Emberizid totals”. That is corrected on the web page to “15 Dark-eyed Juncos round out the Emberizid totals”.